Nannies 4 Grannies have helped my mother regain her confidence after her sight deteriorated suddenly last year. They are an extra pair of eyes for her. More than that, they enable me to go away confident in the knowledge that she has companionship and help that she needs. I have always been very independent. Last year my macular degeneration suddenly deteriorated. 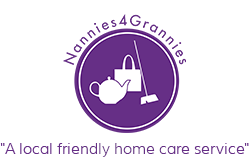 Nannies 4 Grannies have helped me stay in my own home. We do a variety of things. They take me shopping and help me with everyday tasks and we often go for a walk. They are very adaptable and visit as often as I require.